Josh Gad (the voice of Olaf from “Frozen”), who is a big Star Wars fan, was the panel host. Those on the panel were Chris Beatty, Asa Kalama, Margaret Kerrison, and Scott Trowbridge from Walt Disney Imagineering and Doug Chiang and Matt Martin from Lucasfilm. Josh asked different questions of the panel in regards to Galaxy’s Edge and some fun announcements came from those questions. Here are some of the announcements. Disney announced that Coca-Cola designed special bottles for Star Wars: Galaxy’s Edge. The regular Coke, Diet Coke, and Sprite bottles are all short round bottles with screw tops that kind of look like gears. The Dasani water bottle is a taller sleeker design. What all the bottles have in common though is that the names of the drinks are written in Aurebesh, which is pretty cool and makes these bottles extra unique. With the Play Disney app guests will be able to interact with some droids, scan different props around Batuu (the name of the planet for Star Wars: Galaxy’s Edge”), translate Aurebesh to English, and tune into different satellites around the land. Check out Asa Kalama’s description of the new features in the video below. Something else Disney included in this new land is a game that everyone can play. It involves the “blinky light panels” that you will see around the land and choosing a side. See the video below for more information on this interactive game. If you have been on Na’vi River Journey in Pandora – The World of Avatar, then you know how far Disney Imagineering has come with animatronics. The movements are so fluid and they look more alive than they ever have. Well, the Hondo Ohnaka animatronic is no different. He is a part of the Smuggler’s Run ride, so look for him there. Here’s a video Disney shared at the Star Wars Celebration Chicago. Disney shared more pictures from the land during this weekend’s event. The pictures give a better idea of just how immersive this new land is going to be. As we get closer to the opening dates, hopefully Disney will give us more information. It was fun to hear these announcements and they have surely helped keep the anticipation up for the opening of this new land. You can watch the full replay of the panel below from Disney Parks. Star Wars: Galaxy’s Edge will open in Disneyland on May 31st and it will open in Disney World on August 29th. 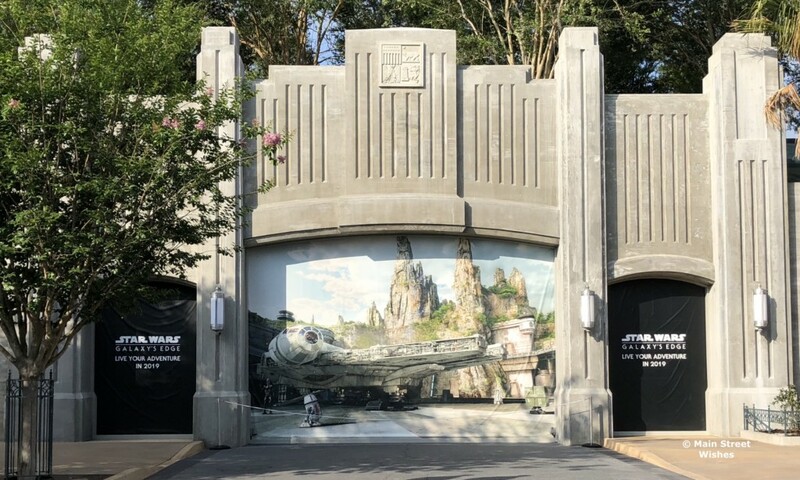 Are you excited for the opening of Star Wars: Galaxy’s Edge? I grew up on the original Star Wars trilogy. The newer stuff is okay but to me nothing compares to the originals. I am really excited to see a full size Millennium Falcon as Han Solo was always my favorite. I cannot wait to hang out in the queue area in the front hold of the Falcon before actually getting to sit in the cockpit and fly the ship that “may not look like much, but she’s got it where it counts.” That being said, I think Disney went overboard with the immersive theme. We are not in costumes playing a role playing game. We are enjoying Disney World. With the size of the new land there should be more than 2 rides. Look how much smaller Toy Story Land is, and they have 2 new rides and 3 total. The same could be said for Avatar, but as popular as Star Wars is to people of all ages, I think they should have used the space better to have more attractions and spread the crowds out. Just my 2 cents.